Keeping your pool in good shape involves a lot of work, but it becomes easier if you allow us work with you. We are a pool cleaning company from Concord and we serve clients from all the surrounding areas. By incorporating our maintenance routine into your daily responsibilities, you will be able to spend more time sunbathing rather than dealing with a messy pool. This is exactly what we want for you-to have an enjoyable and stress-free life. Do you have a swimming pool that is becoming a burden to you? Kindly let us know in our online inquiry form or reach to us by dialing (925) 269-9399. Our technicians will never skip a pool cleaning schedule. We have a large number of technicians in our company, spread out throughout California to make sure that none skips their job because of too much workload. If you didn’t know, bad pool technicians will skip pool cleaning days once in a while and don’t have the courtesy to make up for lost services. These are probably from new or inexperienced companies that do not have sufficient employees to accommodate the growing business. Our case is different. We have been in service for a long time and have the best service crew around California so that your weekly pool-cleaning will never be undermined. If you are in doubt, request a drop ticket from our technicians. We are a reputable company and to maintain trust with our clients, we leave tickets n your doorsteps with details of the service. Most people think that pools only need heavy maintenance during summer when they are very busy. Taking care of the bathing area is equally important during winter. The last thing you need is to remove pool cover as summer knocks on the door and find a leaking or green pool. Therefore, making the right move to winterizing the swimming area will save your money and time that would be used for repair in the next season. Before you close the pool because winter is here with us, just give us a call and we will come straight away. We use a testing kit to check the chemical balance. If there is no balance, we do what is necessary. We also drain any excess water from the plumbing and then install an effective cover that protects the pool from dirt and debris. 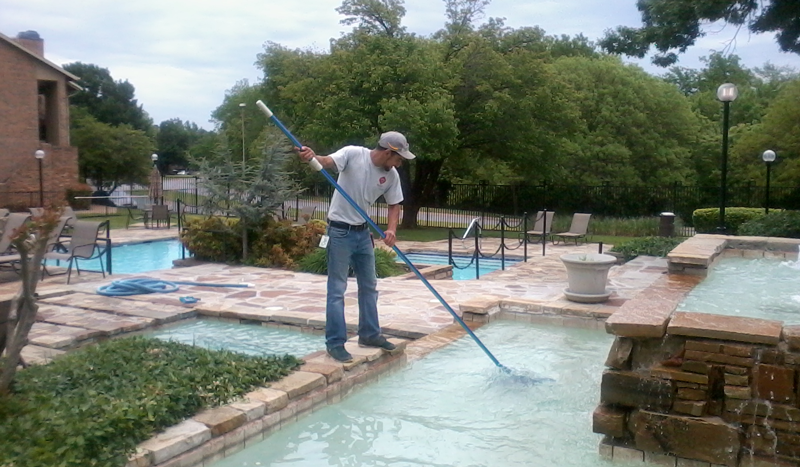 To disinfect your pool we apply a stabilizer, normally in form of cyanuric acid. The chemical forms a shield on top of the water and prevents chlorine loss by making it resistant to UV damage. The cyanuric acid is a white powder that sinks to the bottom of the pool and then dissipates evenly after some days. Brushing can help to spread it in the pool. We normally do this during the spring seasons, but if your pool is prone to high water loss, we condition it through the entire summer. The chemical is not cheap and we ask our clients not to backwash the filters after the stabilizer has been added until a few days elope. Conditioning of pools is very important whenever there is a fill up. Swimming pool licenses depend on the state where the company is located. Our company is registered with the tax department and has its own identification number. Do licenses have anything to do with clients? Of course yes. If you need a major repair in your pool for instance, the state authorities expect our technician to do a licensed job. If you have any questions ask our field officers and you will find answers. We are also a fully insured company just so to give you peace of mind. We receive calls from Concord and related cities like Alamo, Orinda, Walnut Creek, Pittsburg, Hercules, Benicia, Antioch, Pleasant Hill, Clayton, San Ramon, Danville, Bay Point, Moraga, Lafayette, Martinez, among others. You have so much to learn about pool maintenance as long as you agree to work with us. Call our service department on (925) 269-9399 to get a quick response. You may also check our website for more information.